Teepee tents make play time so much more fun for kids. Add a bit of personalised detailing and you can be sure you have a winner! These gorgeous handmade, detailed and personalised kids teepees will be a keepsake and a childhood classic your kids will love. These beautiful kids teepees have the perfect amount of room for kids to snuggle up in with all their toys, giggle in delight as they host tea parties or club meetings, have a blast as they craft and colour or simply drift away to sleep gently! Lovingly crafted by hand in Australia, these personalised kids teepees will have your child’s name/s appliqued on in their favourite colours! These teepee tents are perfect for indoor and outdoor play and kids will love using them to read, play, craft, nap and more! Easy-to-assemble and super-stylish to look at, these teepees make great décor elements too! 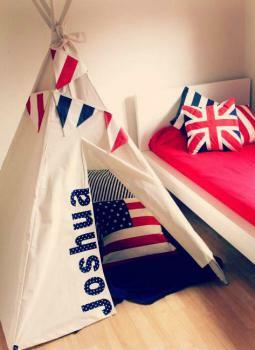 These personalised kids teepee tents will hold tons of happy memories for kids. This will be their soft spot to land on when snuggling with toys, hosting pretend play parties, reading a book, colouring and crafting. Teepee tents make learning tons of fun too. Not only do kids learn to enjoy and appreciate quiet time and reflection, but they also nurture their imagination and creativity as well.